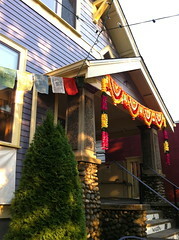 Travelers Tea Company has added bright new color to the purple house on Beacon Avenue. Photo by Wendi. We’ve always been open with our customers, our community, when we’ve needed your help, and you have always come through for us. Thank you for your continuing support that has allowed us to survive 13 years, including some very hard times. Travelers is again at a difficult point, our survival depends upon your support. We have been really excited about our new restaurant, and we were slammed with customers when we opened the doors. We hired more people, “real servers,” more kitchen support, a Nepali farm woman (seriously!). All great folks. But business has dropped off, and the bills kept coming. Payday is coming, and we need your help. You can add up lots of little stuff and still get the 20% discount. With the certificates, the extra 20% can be a separate $20 certificate if you prefer. We’ll be open at both locations with tasty food and beverages. We have wine and beer too at the Beacon location (try a Taj from India, or a Kingfisher), delicious with pakoras. Though we don’t like reviewing restaurants until they’ve been open for a few months, we’ve been to Travelers several times already and found the food to be tasty and inexpensive. We like it, and hope they will stay around. See also this story at the Capitol Hill Seattle Blog. north beaconpurple restaurant houserestaurantstravelers tea co. 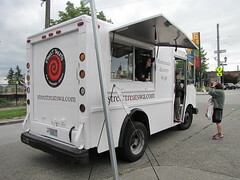 The Street Treats van on Beacon Hill last summer. Photo by Wendi. The work at Bar del Corso (the former Beacon Pub, at 3057 Beacon Ave. S.) is continuing, with a projected opening date of mid-June. You can see a few more photos of the site in progress on the Bar del Corso blog, along with a picture of the blue-and-white-tiled pizza oven. We previously mentioned the new Travelers restaurant which will soon be serving Indian food in the Culinary Communion/Tasha’s house on Beacon Avenue. Allison Austin Scheff at seattlemag.com posted a short article about it this week, with a bit of information about the menu and the projected opening date: late June. The CHS Capitol Hill Seattle Blog posted an article about Travelers last week, discussing owner Allen Kornmesser’s intent to continue operating the original Travelers Tea Co. on E. Pine St., while expanding to the larger Beacon Hill space. It’s not quite summer yet, but it’s getting closer! Along with a bit of sunshine, another sign of summer this year is the return of the Street Treats dessert van, serving cookies, ice cream, and dessert bars. Owner Diane tells us the van will return to the vicinity of 16th and Lander this Friday night from 6:30-8 p.m. The folks opening Bar del Corso in the old Beacon Pub space have posted a few photos of the work they are doing on the building. Looks like it will be a bit brighter inside, now that they are stripping paint off the old transom windows. Thali meals like this may be served in the former Culinary Communion space soon. Photo by Shahoo, via Creative Commons. Further down Beacon Avenue in the old purple Culinary Communion/Tasha’s Bistro Café house, a sign indicates that another new restaurant will open this summer, and this one will feature Indian food. We haven’t been able to reach anyone there yet, but it appears to be a branch of Travelers Tea Bar on Capitol Hill, and will feature vegetarian thali meals (here’s an example of the menu at the Capitol Hill café).